Early Digital Echo / Reverb with Shimmer. VST, AU and AAX. 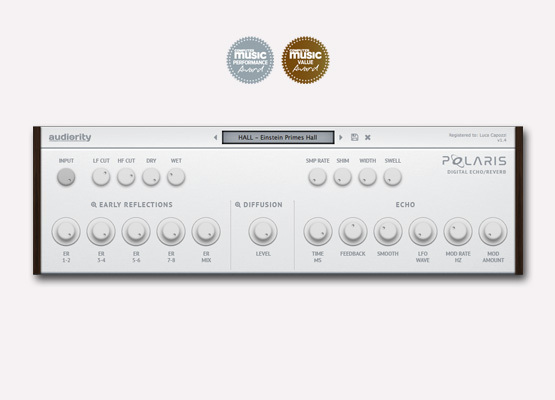 Polaris is an echo/reverb plugin inspired by early hardware digital reverbs of the late 1970s (like the Ursa Major SST-282) and able to provide echo, ambience and reverb out of a single multitap delay line. When hardware digital reverbs came out to the market they were really expensive. Most manufacturers were already exploiting chains of comb and allpass filters (smoother reverbs, but expensive in both resources and chips), there were other techniques involving the use of a single multitap delay line to create a reasonable reverb while keeping the cost affordable. That idea is so simple yet powerful: you mix a bunch of unmodulated taps (Early Reflections) with the remaining modulated taps (Diffusion) to create a cheap but convincing reverb. We extended this technique by making the Echo tap recirculating with the Diffusion section, allowing longer reverb tails. 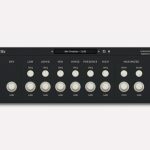 Furthermore you can easily edit all taps to create your own room responses, resonant combs, Karplus-like tuned delay lines, Chorus, Flanging, Vibrato and much more. From v1.1 we introduced new features like Shimmer, internal Sample Rate reduction (useful to get a vintage digital sound) and Stereo Width (Ping Pong delay). From v1.3 we introduced a Swell feature that will smooth the transients of the incoming signal, with its attack time automatically matching the delay time. This new feature works great for ambient guitars, intense endless pads and much more. From v1.5 we introduced Pre-Delay, Modulation Boost and a 3 Band Feedback Equalizer on the new Echo editor page. As a composer for film and media I am always looking for a unique sound for a certain mood. Polaris has become my go to source for inspiration. I just insert it into a simple piano or acoustic guitar channel and choose a preset and I am on my way. The compositions practically write themselves. I also use as a backdrop for my compositions quite a bit. I am usually a tweaker but find the presets are great.. 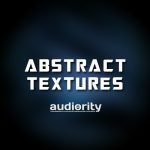 The new update adds a lot in the way of presets and new ways to sculpt sound. I have began to use it on the master buss recently to create a different vibe..The long decay on some of the presets is amazing. I have used with cello and violin tracks with breathtaking results! I have added it to all my templates. I strongly suggest you download the demo and hear for yourself. I’ve been looking at how to create the guitar sound on Tycho’s Awake album, and I’ve tried a bunch of plugins from different vendors. This is the one I’ve been looking for. Just get it. You won’t regret it. So many creative things you can do with this.